Our house faces 40 degrees west of south, but the PV has still managed to produce around what was predicted for a south facing roof. 5th Sept 2016 saw us pass 20MWs of home generation. PV typically produces 75% of its annual output over the 6 months through summer when the sun is higher in the sky, and the remaining 25% over the other 6 months. Good Energy pay us 9.9p per kWhr for all our electricity plus 4.5p for 50% of total generation assumed as exported, we get this rate as our PV was installed before the Feed In Tariff was announced. If you install a PV system now you could get around 4.5p/kWh plus 5p/kWh for the 50% assumed export, but the generation payment rate is reduced each quarter so this figure is approximate. By April 25th 2017 we have generated as much as imported this year, This year with greater generation but also higher usage it took about a month longer to get to this point. Full details on Grid connect PV page. January -This month we generated very close to last year. Generated 99 kWhs(last year 101kWhs). Feruary -This month was very sunny with record generation especially in the last week. Generated 220 kWhs(PV-GIS 160kWh last year 207kWhs). March -This month started very overcast but finished with a very sunny week Generated 290 kWhs(PV-GIS 333kWh last year 229kWhs). By 28th May 2018 we earned as much from our electricity as we owed on our electricity bill. Technically from then on we were in credit for our electricity bill, despite not getting the full FIT amount as weekly generation exceeds import. Though now we have an electric car imports have risen in the first full year to just over double the previous imported kwhs total. The solar hot water system produces over 70% of the hot water used in this house. It produced 100% of the hot water from early March to middle of September in 2000. 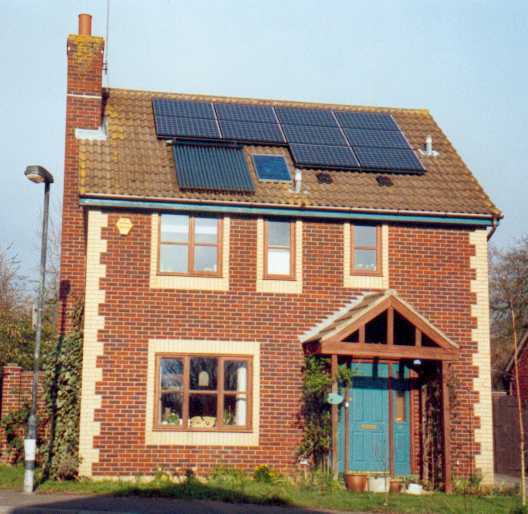 Proving to us that solar power really does work in England. We normally turn the boiler off for around 5 months in the summer each year. The solar hot water system was installed as a DIY installation, but the Renewable Heat Incentive was launched April 2014 for domestic properties which will pay you for the hot water you generate if the system is installed by an MCS accredited installer . Our house faces approximately South West which is not the optimum direction, but even so water temperatures in the summer regularly reach over 60 deg C and in the middle of winter on a clear frosty day we have got the water heated up to over 40 deg C even though the air temp is below O deg!!! I hope you find this site interesting, please email me if you have any questions or comments.